According to some studies, people with dental insurance plans are over two times more likely to receive regular dental care than those who do not have dental insurance. Regular dental care can reduce your risk of serious dental health problems. Our United Concordia HMO dental insurance dentist in West Hollywood can provide you with the dental care and information you need to maintain good dental health and better overall health. Many people procrastinate when it comes to their dental health. After all, regular brushing and flossing can keep plaque and tartar at bay. However, even the most dedicated brushers and flossers can easily miss areas that must be professionally cleaned. Additionally, biannual dental checkups give our United Concordia HMO dental insurance provider in West Hollywood an opportunity to evaluate your dental health. Early diagnosis of common dental health problems ensures we can treat them more conservatively, which means less stress and expense for you. Our dental health professionals offer a full range of dental treatments, including routine exams, professional cleanings, tooth-colored fillings, root canal treatments, orthodontics, pediatric dental care, dental implants, periodontal treatments, dental bridges, full and partial dentures and cosmetic treatments, such as teeth whitening, Lumineers, Invisalign, porcelain veneers, porcelain crowns, inlays, onlays and dental bonding. We understand that some of our patients delay or ignore essential dental health care due to dental anxiety or phobia. Our office is designed specifically to meet their needs. Our staff is warm and friendly, and the office has a relaxed, comfortable atmosphere. We also offer sedation options, including inhaled sedation and oral sedation, to ensure maximum comfort throughout any necessary treatments or procedures. Our dental office has morning and evening hours, and we offer emergency dental care when necessary. 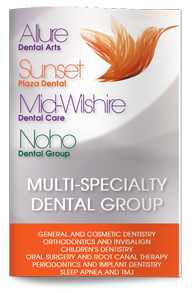 Give us a call today to learn more or to schedule your next appointment with our West Hollywood cosmetic dentist.